Who celebrates the Oregon Trail? 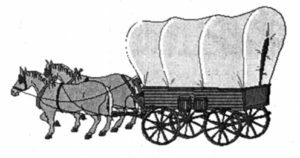 Beginning in 1840 with the small group of raggedy mountain men who accompanied Joe Meek and Robert “Doc” Newell, the first wagon crossed the mountains and reached Oregon Territory. Well, the first wagon wheels… they had to throw the bed of the wagon aside as they fought their way through sagebrush, over mountain passes, through forests and high desert plains. Meek and Newell were not the first to arrive at the fine lands of Oregon. The missionaries had preceded them in the 1830s, and the fur traders had set up posts in the region since 1811. Little homage is paid to the people who were already living here, and had been for well over 10,000 years. The Indigenous folks, the River People, the collective tribes and bands of native peoples of Ni’ chi-wana, the Big River, had their homes here already. They saw the stream of explorers and pioneers first as a curiosity, then a source of trade, but eventually recognized in horror what was really happening. It was an invasion. By the time they recognized that fact, the damage was well underway, as their people were decimated by disease and the flood of people setting up towns on the lands they once roamed freely. The year 2018 marks the 175th anniversary of the Oregon Trail, commemorating it from the year 1843 which saw the first big emigration. But as we celebrate the stalwart spirit of those pioneers who braved hardship to carve a new life for themselves and their families, let’s also commemorate the regional Indigenous people whose ancestors did the same thing over 10,000 years ago, and who have been and are survivors in the face of multiple adversities – not the least of which is the settlement of this noble territory by Euro-Americans and their descendants.